Hello Everyone! It's Johanna, and Steve has allowed me to take over the blog from time to time to talk about deep learning. The developer of the demo is Heather Gorr, who's been doing lots of work with Deep Learning lately. She is a demo creator and presenter extraordinaire. She creates demos that we present to customers, but for those of you not able to attend one of these presentations, we'd like to show you one of these demos here. 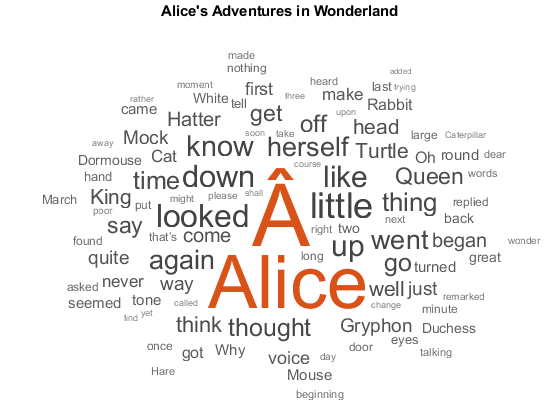 This example is based on the new capabilities in the Text Analytics Toolbox, and proves it's not always about images in this blog. Imagine typing in a term and instantly getting a sense of how that term is perceived? That's what we're going to do today. What better place to start when talking about sentiment, than Twitter? Twitter is filled with positively and negatively charged statements, and companies are always looking for insight into how their company is perceived without reading every tweet. Sentiment analysis can have many practical applications, such as branding, political campaigning, and advertising. 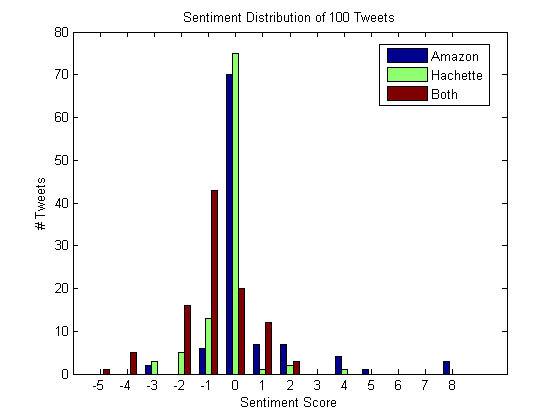 In this example we'll analyze Twitter data to see whether the sentiment surrounding a specific term or phrase is generally positive or negative. 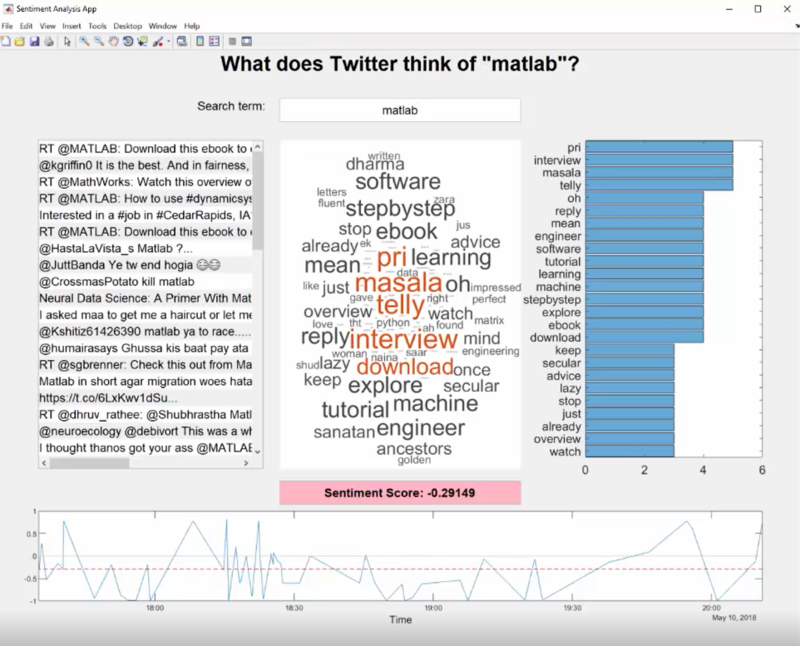 If you are doing any sort of text analysis, you should really check out the new Text Analytics Toolbox. I’m not a text analytics expert, and I take for granted all the processing that needs to happen to turn natural language into something a computer can understand. In this example, there are functions to take all the hard work out of processing text, something that will save you hundreds of hours. Secondly, I just discovered that if you want to plug into live Twitter feed data, we have a toolbox for that too! This is the Datafeed Toolbox. It lets you access live feeds like Twitter, and real-time market data from leading financial data providers. Any day traders out there? Might be worth considering this toolbox! How were these classified as positive and/or negative? Great question! After all, we could have an argument/debate on whether “Back to work!” could also be a positive tweet. The categories of training data can be determined through manual labeling, using emojis to label sentiment, using a machine learning or deep learning model to get determine sentiment, or a combination of these. 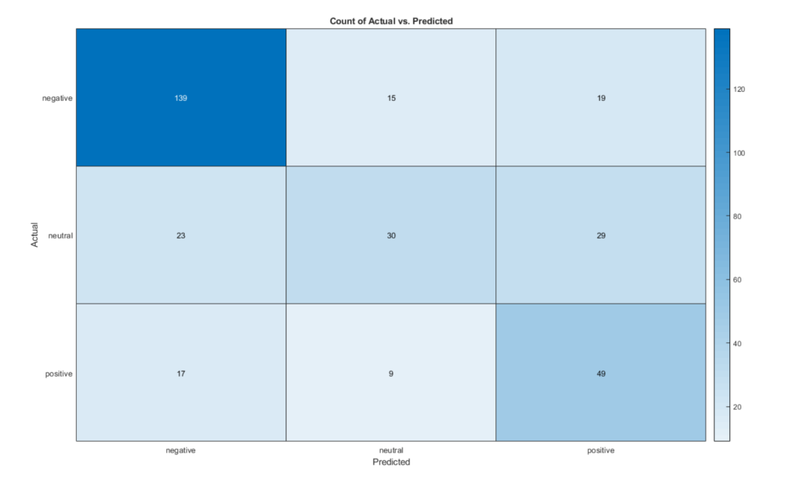 I'd recommend verifying that you agree with the dataset categories depending on what you want the outcome to be. For example: move "Back to work!" into the positive category if you think this is a positive statement; its up to you to determine how your model is going to respond. We can also remove “stop words” such as “the”, “and”, which do not add helpful information that will help the algorithm learn. And then perform “word embedding” which has been explained to me as turning words into vectors to be used as training. 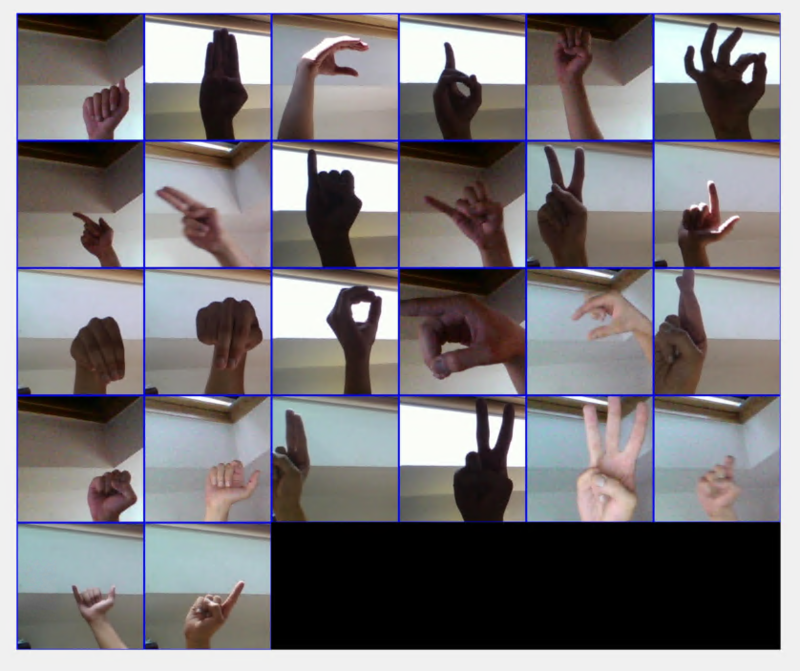 More officially, it can be used to create a word vector based on unsupervised learning of word co-occurrences in text. Word embedding are typically unsupervised models, which can be trained in MATLAB, or there are several pre-trained word vector models with varying sizes of vocabulary and dimensions from a number of sources like Wikipedia and Twitter. Another shameless plug for text analytics toolbox, which makes this step very simple. We can then set up the structure of the network. In this example we'll use a long short-term memory ( LSTM) network, a recurrent neural network (RNN) that can learn dependencies over time. 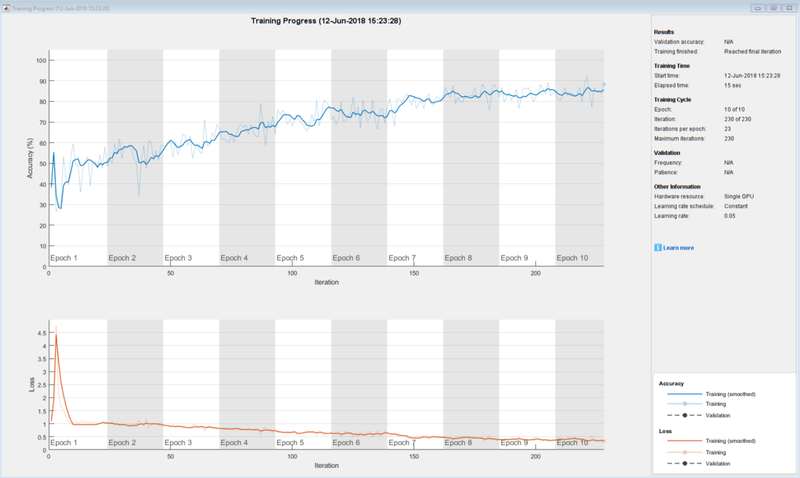 At a high level, LSTMs are good for classifying sequence and time-series data. 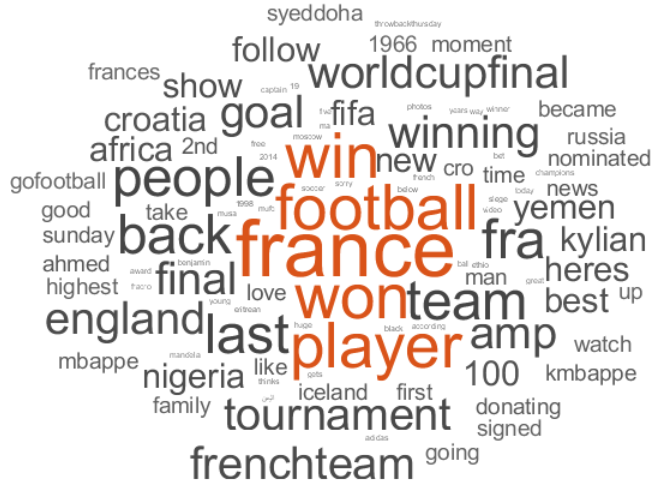 For text analytics, this means that an LSTM will take into account not only the words in a sentence, but the structure and combination of words, as well. When run on a GPU, it trains very quickly, taking just 6 minutes for 30 epochs (complete passes through the data). Once we've trained the model, it can be used to see how well it predicts on new data. I spoke with Heather about the results of this model: There are lots of ways to interpret the results, and you can spend lots of time improving these models. For example, these are the results of very generic Tweets, and you could make them more application specific if you wanted to bias the data towards those results. Also, using the Stanford word embedding increases the model accuracy to 75%. Before you judge the results, it’s often helpful to try this out on data that you want the model to be successful. We can take a few sample tweets, or make our own! These are the few that I decided to try. tw = ["I'm really sad today. I was sad yesterday too"
"This is super awesome! The best!" "Everyone should be buying this!" 1. When choosing training data, did you pick random samples of all Tweets, or did you capture a certain category of tweets, for example political, scientific, celebrities, etc.? If I'm working with finance data, I pick stock price discussions to make sure we're getting the right content and context. But it's also good practice to include some generic text as well, since it's good to have your model have samples of "normal" language too. It's just like any other example of deep learning - if you're really intent on identify cats and dogs in pictures, make sure you have lots of pictures of cats and dogs. You may also want to throw in some pictures of images that could easily confuse the model too, so that it learns those differences. 2. Is this code available? I will have the demo on FileExchange (in about a week or two), but the live Twitter portion has been disabled, since you'll need the Datafeed toolbox and your own Twitter credentials for that to work. If you're serious about that part, you can look at the demos in Datafeed toolbox which will walk you through those steps. 3. The calculateScore function, is that something you created? How do you determine the score? I made it up! There's lots of more sophisticated ways of doing score, but since it brings back the probabilities of the 3 classes, I set neutral to zero, and normalized the positive and negative score to create a final score. Text analytics is a really interesting and rich research area. There's still new research coming out, and it's up and coming. Preprocessing text is really different and offers a completely different set of challenges than images. Numbers are more predictable, and in some ways easier. How you preprocess the text can have a huge impact on the results of the model. 5. Can you really predict stocks with this information? Tweets really do track with finance data, and can give you insight into certain stocks. Bloomberg provides social sentiment analytics, and has written a few articles about the topic. So you could just use this score, but you have no control over the model and the data. Plus we already mentioned that preprocessing can have a huge effect on the outcome of the score. There's a lot more insight if you are actually doing it yourself. Thanks to Heather for the demo, and taking the time to walk me through it! I hope you enjoyed it as well. Anything else you'd like to ask Heather? What type of demo would you like to see next? Leave a comment below!